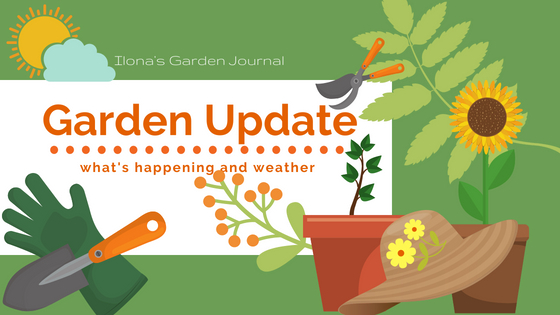 I learned that I can’t judge a winter’s toll until June, and even then it remains to be seen what a tough summer may inflict on the garden in general and shrubs and trees in particular. Here is what I have observed about my Central Ohio garden so far. > I thought two of the Sweet Gum trees were goners when I checked them last month. I was ready to mourn them and have my husband get out his chainsaw. However, it appears that they had only been grievously delayed by the winter blasts of this past spring. I was so happy to see small tufts of new leaves indicating they may not have been doomed after all. Many of the lavender shrubs sprouted from the base. Severely cut back and in need of an infusion of new plants to fill it, it has spelled renovation for the feature. Plans had been made to just tear out everything and do something else to line the walk. Right now I am in the process of cutting back both dead lavender and half dead rue to the ground- even though it is a little late in the season. I only have so much energy and physical resources to cover a multitude of tasks around here. 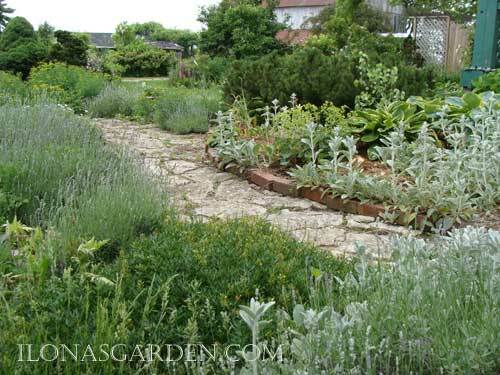 > Both the thyme and the sage had to be pruned to stubs, as well, although some of the thyme was altogether lost, a tiny bit survived. such things make me happy all out of proportion to what they are. > I allowed the mugo pines to go unpruned this year, and I am wondering whether to just trim the new growth? I would permanently head back those branches if I cut them off at this point. > The paths of the raised vegetable garden beds are being covered with cardboard, and look messy. However a few more cut up boxes and I might cover them with mulch. I am thinking of cypress, although that is awful for bare feet. > The spring is dry this year, but I noticed some of my seedlings sprouting. The hoses need to get in place already. > Tomato plants look miserable here. > The new rose I put in last year looks healthy; I’ll have to look up the name- it went through this winter without protection. >> Even though I love the rose that I think is a Scotch rose or R. spinosissima (AKA Pimpinellifolia), due to its apple fragrance all summer, it savagely tore at me through my leather gloves and long sleeved shirt as I removed its dead and overgrown canes. I had neglected that side of the house and poison ivy had taken hold. So it was slow work, but I am two thirds through with a very onerous job. I am the designated poison ivy remover around the place. My Ash trees are completely dead. -The Emerald Ash Borer got them, this time there is no doubt. Not sure what happened to the ornamental grasses, but the Miscanthus is barely sprouting around one edge (on all the plants). Wondering if they are marginally hardy here, or whether the heavy snows created wetness and rot??? Dog ticks were still pretty bad despite the cold winter. A deer was observed in my front yard. Rabbits have made themselves at home here. I really need a dog. 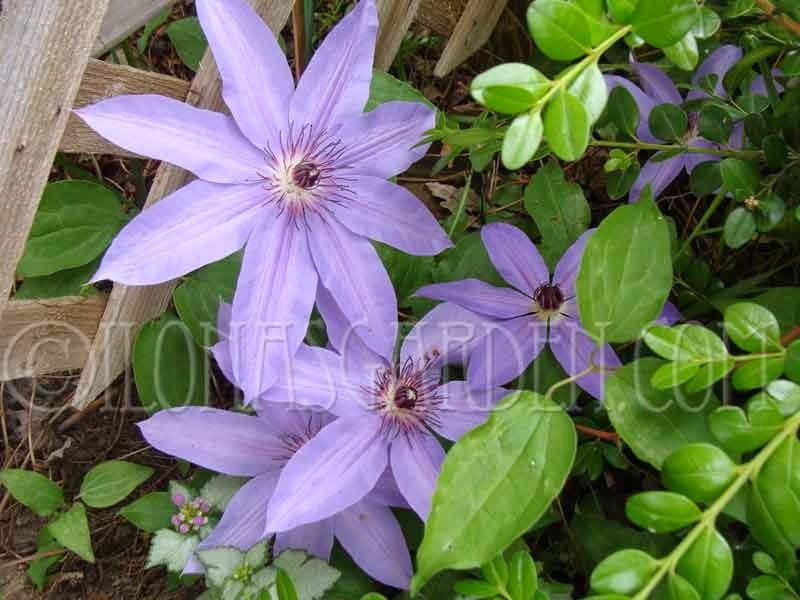 Clematis delight me every year, including this one. Perfectly lovely weather, so that even the nagging concern about rain is pushed to the back of my mind. You would think that something as time honored as gardening would be immune to fads, but anything with the idea of “style” attached will have plenty of action between the “in” and “out” of fashion. I started thinking about this when looking at my two mugo pines. 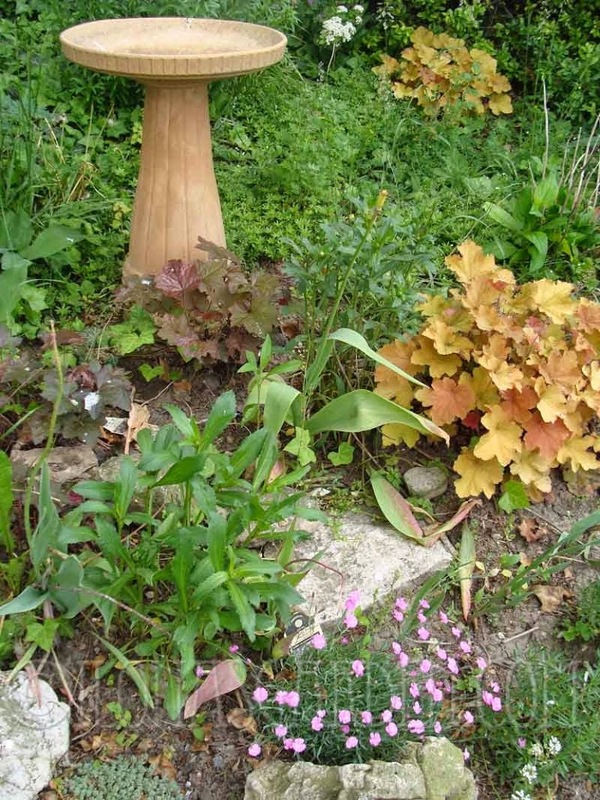 The phrase “in their heyday” came up in my mind, and it got me following a rabbit trail of considering the different plant fads I’d observed through the years. Bradford Pear trees, mugo pines, Euonymous elata aka “Burning Bush”, and those previous to my own gardening career: forsythias and Tartarian honeysuckle. Those are among but a few of the woody plantings that last long after the fad has passed. Fashion in gardening is not a bad thing in itself, but it is shortsighted, and that is not very advantageous when working with something that has a potential lifespan longer than your own. Fashion does not take such terms as “health”, “appropriate”, or time units such as “decades” into consideration when going forward. By its very definition it is more about image than substance. If a plant fashion becomes a “classic” it is more by accident than by intent. Take the Bradford pear trees, for instance. Once considered a top quality “city tree” because the shiny leaves, spring flowering, compact shape, and freedom from fruit were very desirable qualities which created a fashion for it. I remember a suburb that lined its main thoroughfare with them. However, some windstorms later, the weakness of this tree, its proclivity to split off large branches and become misshapen (not to mention potential harm) led to a wholesale removal of these trees. Now most Bradford pear trees are on a list of undesirables. Of course, many plant fads just fade away, without anything more notorious than be being overused. ‘Stella D’Oro’ daylilies strike a chord with anyone as an example? I don’t suppose there is anything to be done about the propensity we human beings have for becoming obsessed and inured by turn with all sorts of fickle interests and passions, but the wise gardener can keep the more mundane, yet important, principles of using plants in the environment uppermost in their thinking and planning. That would go a long way to prevent the most glaring of plant fad mistakes and regrets. Maybe it is all a matter of keeping in mind that nature, living things, are more than just material in the hands of our making. There is an integrity to how we all are interdependent in the human, animal, plant world and our relation to even the inorganic parts of our globe. And it isn’t even ours as in “ownership”, but rather as “stewardship”. 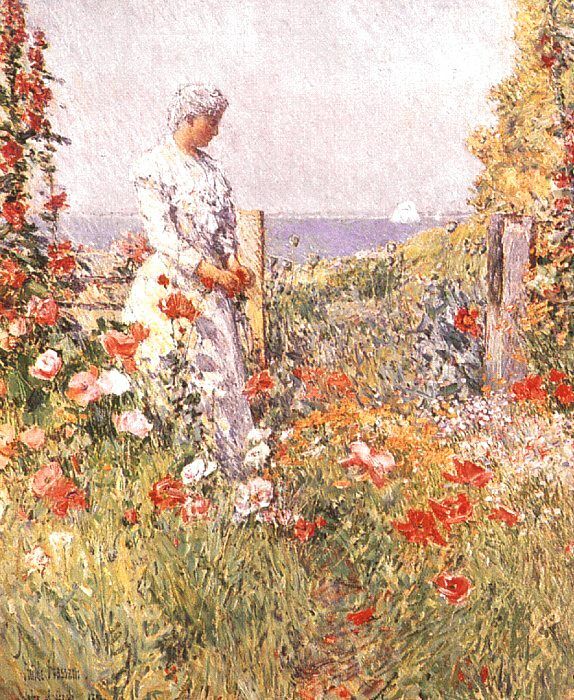 We have a certain responsibility to the care and nurture of it, and while “prettifying” things has its place in our use and cultivation… it also has bounds of reason that makes for the true nature of beauty. We can get sort of crazy in our ideas otherwise, and it just doesn’t work out well for the long run. The “long run”, the stretch of generations, is how we ought to look at the impact of our use of the earth, even while we have a bit of fun with the types and colors of petunias and roses. These were just a few thoughts that were sparked by my garden, and those two mugos… one of the first things planted in my yard. 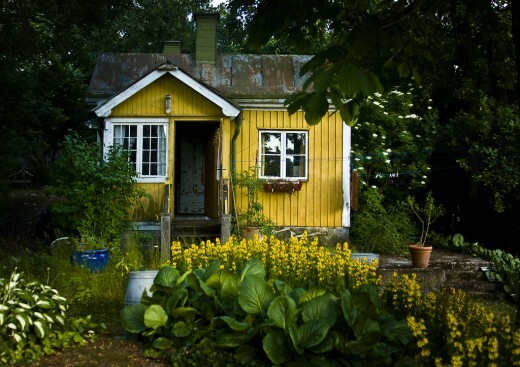 Look around your own yard with an eye towards the benefits that plants of the past my hold. If they are more of an eyesore, or a nuisance, why keep them? I still like Stella D’Oro Daylilies and recently planted some at the front of the driveway. Why? 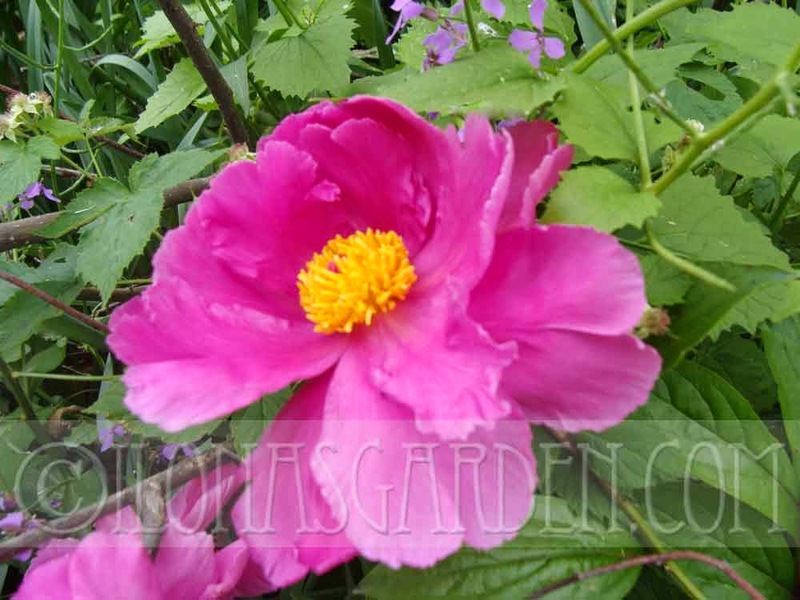 Their long bloom, bright color, and toughness are just what that spot needs. 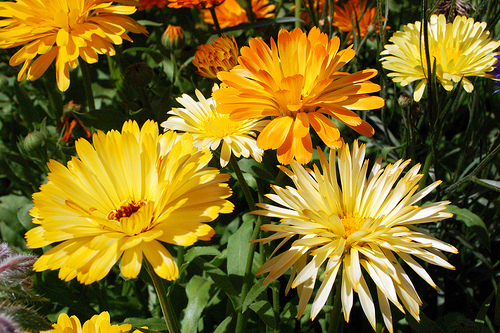 Consider some fresh new ways to use some of the old plant fads. What plants are on your “fads” list? The candle growth on a pine. Today people are looking for information on how to prune a mugo pine. 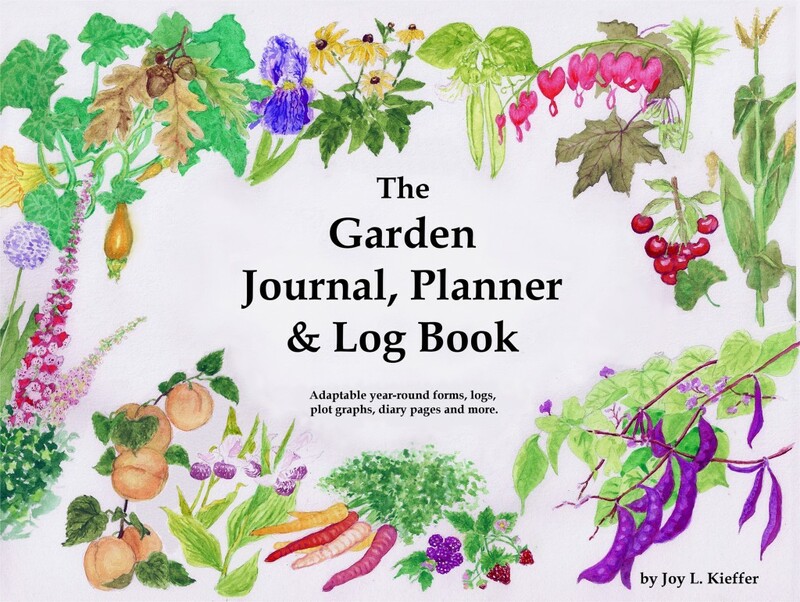 That is the Google interpretation of what people want from this garden journal. It is just a little too late to be asking that question. Ask me how I know timing is important for pruning? I was out of town when the time to prune the mugo pines was in season and I missed it. 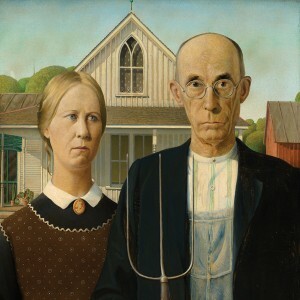 I had pruned off about half the candles of the one nearest the porch, but then got busy getting ready for my trip South and never resumed the job. The other Swiss Mountain shrub ( aka Mugo) … the one that is already grown out of bounds on the other side of the house… didn’t get pruned at all. I think it is a tree, now. Luckily, the location is fine for its growth; but still, I had not intended for it to be more than a shrub. It got away from me. This has been a year for that, so far. I started weeding the stone walk yesterday. The front garden will get mown (that is held off until bulb foliage matures), and will continue the “front yard recovery act”. At least the weather has been nice! 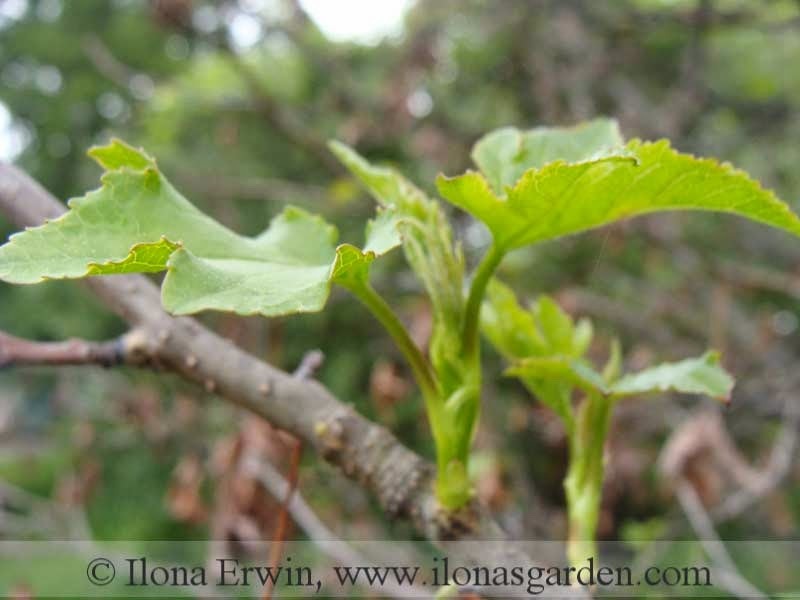 © 2011 written for Ilona’s Garden Journal. An excellent blog. I started the other day: hand pruning the Mugo pines by cutting off the new candles midway down. Neglected it the past few years and my -now- small trees are spreading more than I like. So I just started snipping and finished 3/4 of one and will get them both done this weekend. Just a bit tedious, but not difficult. You can see how large I let this one grow by the photo, but it is off to the side and is fine for now, although visually it takes up space. The other one has stayed about a third of this size. oh. and that is my favorite cat waiting for some poor unsuspecting birdie. Handyman and I call him “Bob”, the kids call him “Assassinator”. My favorite cat ever (I’m more of a ‘dog’ person). He has so much gumption and personality, but is slightly more scared of things since the time we got him “fixed”- didn’t trust people so much after that. heh. All about pruning your mugo pines, from earlier posting. Don’t trim or prune your pine in the fall. That is the short answer. Pines will stop growing from the points at which you prune off their branches (they do not produce new buds from old wood) if you do it out of season. The right season is when the new candle growth begins in the spring. The right way and time to prune a Mugo is when the new growth (candles) sprout out .You simply spruce them up (couldn’t resist the pun) by cutting the candles in half. Some people say “pinch growth by two thirds”, but I let them get a bit longer and slice them in half with the pruners (secateurs). The main thing is to cut back just the new growth at this time. If you prune in this way it gives the most natural looking trim. I would keep up with it regularly, since mugos often get bigger than their reputation for being dwarf would indicate. 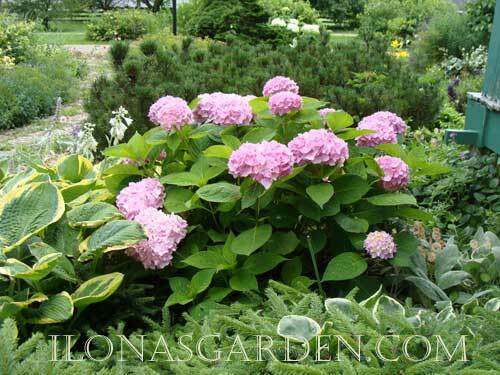 I have two shrubs at this property and had several at my city home years ago. 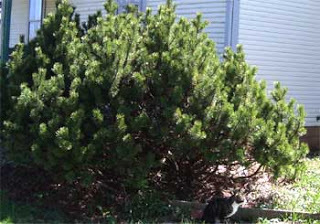 There is a lot of variation in the compactness and ultimate size of pine shrubs labeled “Mugho” or “Mugo”. Mugo Pine’s incredible, yet frustrating, variation is primarily the result of its large native range. Plants with large territories tend to have greater nature/variation than plants with small ranges because they must be flexible enough to adapt to different climactic conditions to survive. Mugo pine’s native range is western Europe, eastern Europe, southern Europe, and western Asia. Such a broad range requires a chameleon-like ability to adapt to different situations, which is why specimens of every size, shape and description can be found. Although there are many kinds of cultivated and naturally growing types, all are commonly known as mugo pine. So there you go- if you happen to have one that grows larger, you can use the pruning technique of halving the candles each year, or so, to control the size. 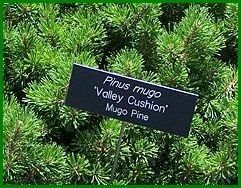 If I were to go shopping for mugo pine shrubs today I would look for the P. mugo cultivars “Mops”, “Sherwood Compact” and “Slowmound”… as advised by Anne Pink. The previous post (2004) on pruning mugo pines. I have to make this small entry, to save someone out there from the butchering I saw was once done to mugo pines. On the other hand, if you don’t keep up timely pruning, you will have a monster bush on your hands ( like said example above). Now (Spring with the new growth) is the time to snip the new growth, called candles. Snipping these growing points is how the pines should be pruned. I usually just cut them half off with shears. 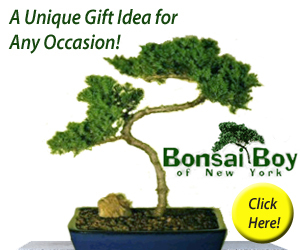 Occasionally, in the larger type (mugos vary) I will cut out the odd branch or two to shape it,. Don’t ever cut pines into their old wood, such as the massive pruning that is done on some deciduous bushes. 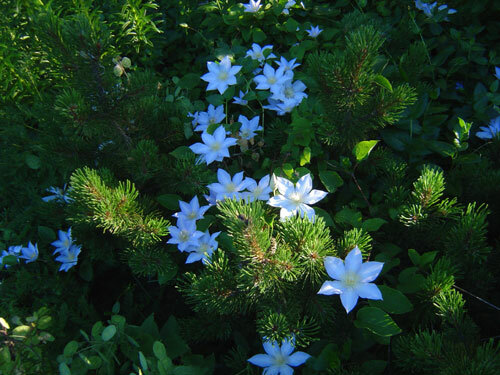 Mugho, or Swiss Mountain Pines are dwarf trees, and they keep their shape well with yearly attention in the spring. It doesn’t take very much time to trim them. Half an hour for a very large shrub. I haven’t spotted them this year, yet, but my mugos have often gotten an ugly case of caterpillars that strip the needles. I hand pick those and burn them. I suppose you could drown them in something, but I live in the country where we can still burn things. A little bar-be-cue stove would work in the city. The things we do for our garden!